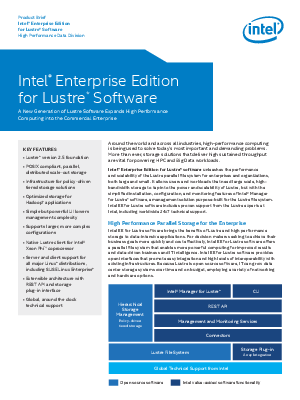 Intel® Enterprise Edition for Lustre* software unleashes the performance and scalability of the Lustre parallel file system for enterprises and organizations, both large and small. It allows users and workloads that need large scale, high-bandwidth storage to tap into the power and scalability of Lustre, but with the simplified installation, configuration, and monitoring features of Intel® Manager for Lustre* software, a management solution purpose-built for the Lustre file system. Intel® Enterprise Edition for Lustre* software includes proven support from the Lustre experts at Intel, including worldwide 24x7 technical support.